Never be the guy that replaces The Guy. Tino Martinez found that out first hand in 2002. It’s tough to replace anyone that has captured the hearts and minds of a city, but to replace a true legend (at least, at the time) of the game? That’s almost impossible. It didn’t help that Martinez was seen as past his prime when the Cards lavished a three-year, $21 million deal on him. Many observers at the time thought that it was a bad deal and Martinez didn’t do a lot to shake that impression in the early going, hitting .200 in April and .236 in May. It didn’t help that Martinez still obviously had left his heart in the New York pinstripes. St. Louis isn’t used to playing second fiddle to anyone when it comes to the devotion of the players wearing the birds on the bat, so adding that into the mix probably added to his dislike around the fanbase. (One person who probably glad Tino showed up was J.D. Drew, who had someone to split the brunt of the fans’ wrath with for a while.) I would imagine that most people have gotten over whatever issues they had with Tino that led to him being booed when he returned to Busch in 2005, but I wouldn’t expect many would care to have him hang around the club. Then again, it’s a moot point–if Tino’s doing anything after his sudden departure from the job of Marlins hitting coach, it’s going to be with the Yankee organization. Ironically, the man that replaced Tino was himself replaced by another 21 ten years later. Allen Craig, though, avoided Martinez’s fate and on the surface, it’s a little surprising. 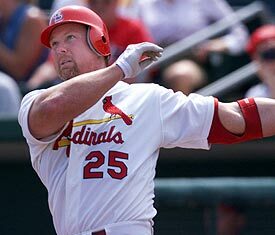 After all, both were replacing legends, people that (again, at the time, since this may not be the case for either of them, especially McGwire) were going to have their number retired by the club and a statue outside the park. However, there were subtle differences that helped Craig not become the newest version of Tino Martinez. 1) Pujols left because someone paid him more money. He didn’t retire like McGwire, honoring St. Louis by making it the last place he played. It wasn’t a mutual separation at the end of a career. Pujols had the chance to return to St. Louis and he decided to follow the money to Anaheim. Whatever you think about that decision, there’s no doubt that it made a shift in how the fan base thought of him and made them more well-disposed toward his successor. 2) Craig was not an import from another team, a veteran on his way out. Instead, he was a home-grown prospect that folks had been wanting to see play regularly. He’d already played in the outfield in 2011, but this would give him a chance to play at the position that seemed best for him. 3) Craig HIT. After starting the year on the disabled list, Craig hit .373 with five home runs in his first month as the starting first baseman, worlds different from Martinez’s struggles. Hitting cures a whole lotta ills in baseball, including fans riding your back. I’m not sure if attitudes have changed much. If Martinez had hit, he’d probably been more liked. We saw that when Craig stopped hitting, he quickly was downgraded in the eyes of many that watch the games. We’re–and I say this not about Cardinal fans but baseball fans in general–still a bit of a fickle bunch, always wanting the next thing and wondering what you have done for us lately. With the coincidence of Martinez and Craig wearing the same number, I wanted to go that route, but I do want to mention a few of the others. Of course, Curt Flood is a trailblazer in baseball and one of the reasons the game looks like it does today. While he might not be a Hall of Famer with his stats–though there’s some debate there as well–his stats plus his place in history probably should get him into Cooperstown at some point. Paul Dean, Dizzy’s brother and another Arkansas boy. I may have relayed that every summer as part of one of my audits, we go to a one-restaurant town. That restaurant is owned by Paul’s grandson and has pictures and stories of Paul and Dizzy up on the walls. I always enjoy looking at them and wondering what baseball would make of Dizzy today. And Kip Wells, well, we know what he did as a pitcher. We also know that one of his crimes was to get me into blogging. We’re fighting our way through the spring. Just three weeks left!